Fantasy Plane Idea for Someone ? I'm putting this 'design' out there for those who are more experienced/skilled than I am at custom design and builds. I found this by scrolling through pictures of propeller driven aircraft on a google image search. It's an interesting idea and I think it could work. It's both a biplane AND a prop-n-slot. I think the tail control surfaces would need to be significantly increased in size, they look proportionally way too small as drawn. 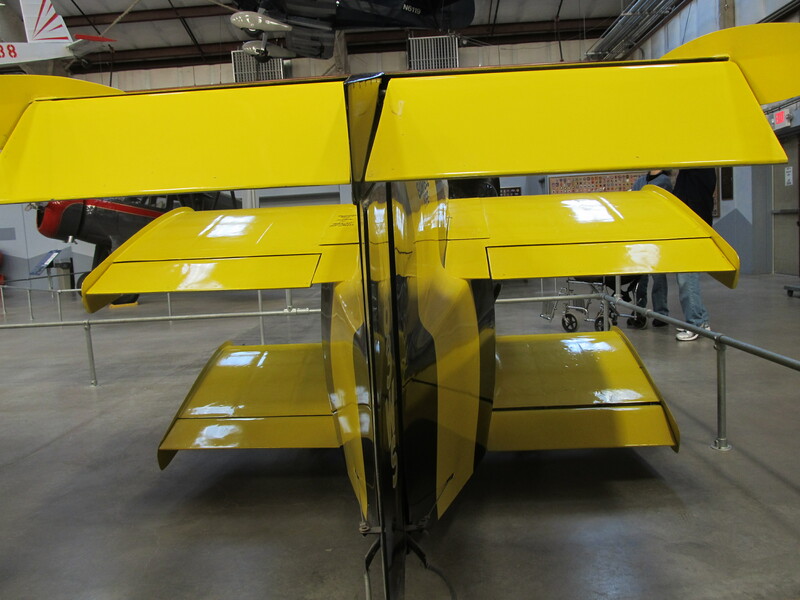 Being a biplane design, I think the wing surface area (lift area) is probably fine. I didn't even notice that...hah! Maybe there is a second engine in the aft fuselage and that's the exhaust? Or maybe this plane actually has two engines (one fore and one aft) and two propellers that contra-rotate? Has a very Crimson Skies sort of look about it. Looking at the cowlings and shaft, I'd say dual engines driving a single prop. An unusual design in aviation but there are a couple that were built, though none with the prop in the middle! Tail is probably too small, the long nose was well thought out as the CG would need to be brought forward due to all that mass in the middle rear. I think it could fly but I wouldn't want to be the guy who has to fly laying on the floor of the cockpit... seems a little uncomfortable. 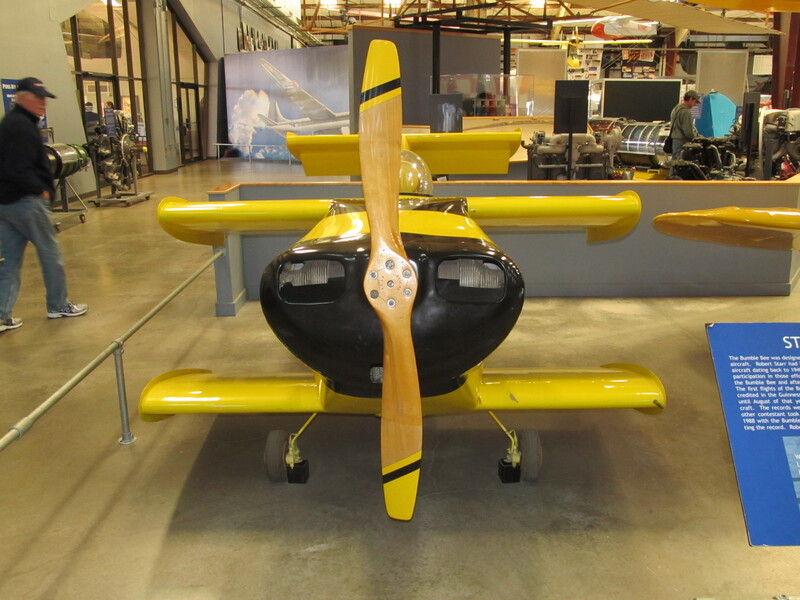 As an RC plane with servos it wouldn't have the big problem it would have had as a real biplane - controlling the tail surfaces and the rear engine. That prop cuts the airframe right in half where the control cables would go! Here is another challange for the scratch builders that should nice to see. Caught this at the PIMA Air museum in Tucson,AZ. Dimensions are length = 8' 10"
Scratchbuilt and flew a YC-14 with a T tail and 2 64mmEDF's. 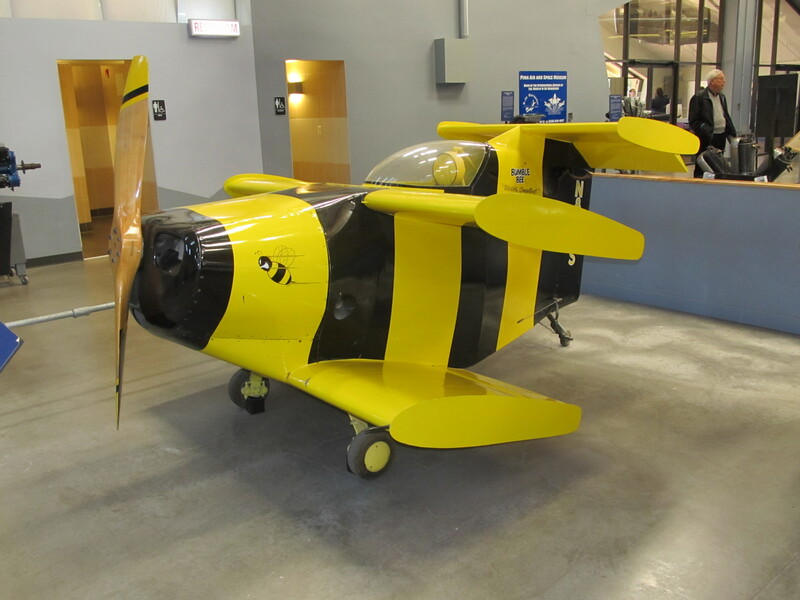 If you take the virtual tour, the BUMBLEBEE 1 is by the H symbol. If you go to Arizona, go see the whole collection and take boneyard tour.